Today as I was unpacking our ornaments I couldn't help but remember certain things as I went through trying to determine which ones to hang on our tree. We have only been married for four years (as of next Thursday) but I had lived on my own for a couple of years and even in my little graduate student apartment I had a Christmas tree. On top of that, what is the number one gifts for a couple married in December? Christmas ornaments of course! As I was going through the boxes, I wanted to share some special ones with my faithful blog readers. Some of what is so special is not the ornament itself but the story behind it. Some are new, some are old. But they are all special. At first glance, this looks like a simple red ball that you can buy by the dozen at any Dollar General. 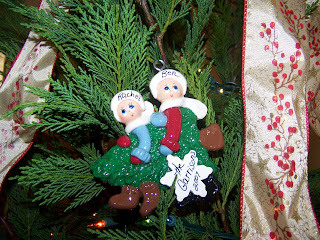 When I look at it, I see ornaments from my parents first Christmas tree as newlyweds. They were also married in December. Last year, our tree toppled over from the weight of all the ornaments and a couple of them broke but I still have several of them. And as long as I have them, they will always have a special place on our tree. Ben will tell you that I love to collect nutcrackers. 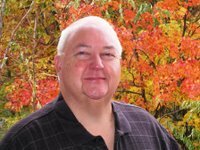 He can't stand them; he says they stare at him and it makes him uncomfortable. My collection is quickly growing. Ben buys me one each year even though he can't stand them. We buy one special ornament a year. Well, sometimes more than one. This is our ornament for this year. 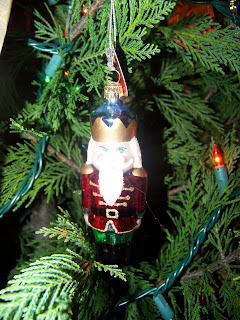 My Uncle Mike began making wooden Christmas ornaments several years ago. Snowflakes, horse drawn carriages, Birds, elves and more. 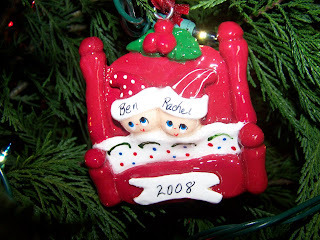 This is the ornament he carved specially for Ben and I the year we got married. 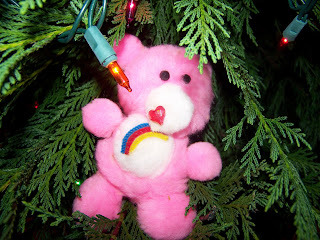 I know this looks like a pink blob but most of you will recognize the Carebear. 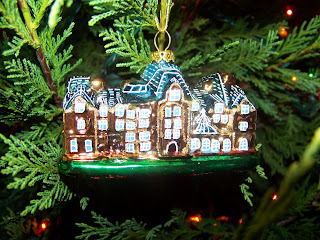 This ornament has to be more than 25 years old but every year, no matter what, it is nestled in among the lights and tinsel. My babysitter, Donna, made this ornament for me many moons ago. My brother Joey had a blue one and I had a pink one. My tree would never be complete without this ornament. This was our ornament last year. Since it was the first year we went to the tree farm and cut down our tree, we figures it was only right that this be our "ornament of the year." 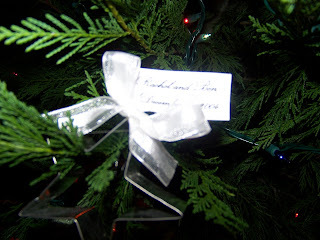 Our tree wouldn't be complete without this ornament from Hawaii. What a special trip and a wonderful time we had. 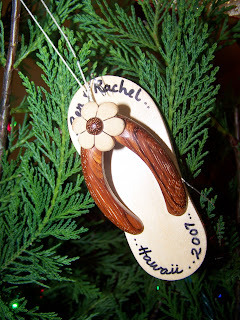 Though the memories will never be forgotten, we can relive those days each year as we hang our little wooden flip flop on the tree! There seems to be several ornaments from the year we got married but this one is special because it was a favor from our wedding. As I mentioned earlier, when you get married in December, loads of Christmas decorations are bound to follow. We gave these silver star cookie cutters away at our wedding. I'm sure no one but my mother kept them but I did. And each year, it goes on the tree front and center. Last but not least, The Biltmore. America's largest home. My mom and I took a trip there in April and we had a wonderful time. Of course, I had to buy a Christmas ornament to remember it by. Sorry for the long post. I hope you weren't too bored. I also hope you enjoyed a peek to into my Christmas memories. I still have my start cookie cutter from your wedding! 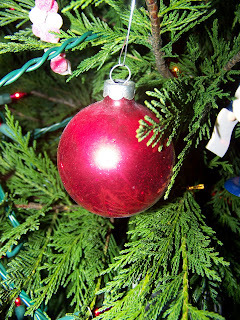 I always go through a flood of emotions as I hang special ornaments on our tree! I still have the two glittery snowflakes that your uncle made that you gave me in college! I think of you every year when I hang them, along with my silver studded "K"! Loved the ornament pictures and what each means to you. Now, we need a full size picture of your tree. Great post Rachel. Our tree may not be the prettiest, but it has ornaments from each year of our marriage and is special to us. 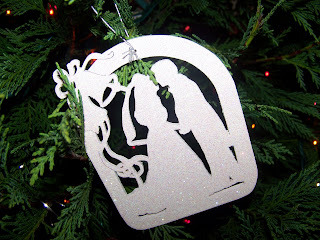 We got married on Dec. 20 a friend painted a box of ornaments for us and we still hang those that have survived the kids. But will they survive the grandkids? Hmmmm. My personal favorite ornament is a simple red construction paper stocking with some cotton balls at the top. It came from a Children's hospital visit when Kim was a toddler. Good memories of family are probably the best thing about Christmas.